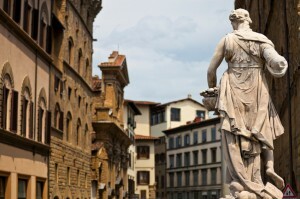 The course provides an analysis of Art and artists who have depicted the national and European artistic landscape, by observing the works, techniques, iconographic choices, and putting them in historical and social context making the Art a path to get closer to the Italian language and culture. The course programme focuses on the history of Art from the Renaissance to the birth of contemporary Art. During the lessons slides of the works will be shown and will be read and discussed. Also, excerpts from the most important Renaissance and contemporary biographical texts and the assumptions of the leading critics of Italian Art will be discussed. There will be guided tours of alternate and/or add to the classes as well. * The registration fee (+ 45€) is valid for one year and it includes learning materials, the opportunity to participate in our social and cultural events, rental of books and films in the original language, Koiné card (for discounted prices for shops/gym/pharm/clubs, etc. in partnership with Koiné), Wi-fi, internet point, up to 2 certificates of attendance and the final exam.